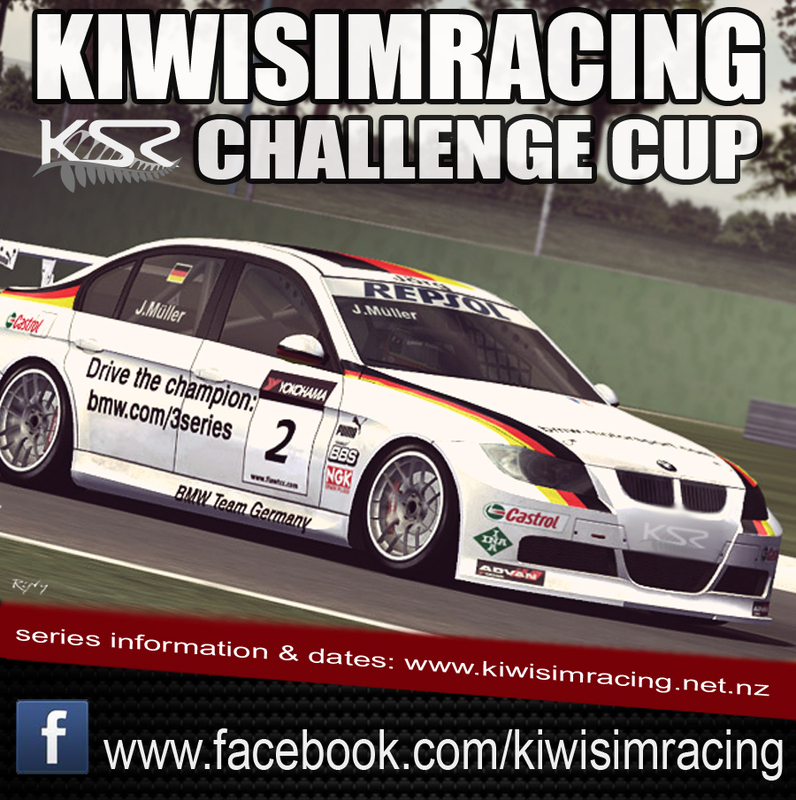 Welcome to another instalment of Kiwi Sim Racing league action - The BMW E90 Challenge Cup. Featuring a well known touring car which promises to be relatively easy to hop in and drive, there should be some great close door rubbing action provided throughout this series. For this series we won't be running qualifying. Instead, we will be using a 'club' style grid format where everyone will get pre-determined grids. What this means is essentially everyone will have an equal 'total' for their grids - whether you have a front start, a rear start and a mid start, or 3 mid pack starts, everyone will have the same amount of cars to pass to win throughout the entire night. With this format we hope to promote some great close racing and overtaking throughout the pack - this series will be more about gaining positions from your rear grids, and holding positions from your front grids, rather than outright pace. This mod features a "Qualifying Tyre" as well as a "Race Tyre" option in the settings. Whilst the qualifying tyre is faster, we are limiting the tyre used in this series to only the Race Tyre. Because there is no way to enforce this within the game without modifying the mod or running fixed setups, we will require a bit of honesty from all drivers that they are running the Race Tyre throughout the series. Obviously we will be able to tell if you aren't as you will have amazing pace and grip at the start of the race and struggle towards the end. Anyone caught running the Qualifying Tyre will be facing a indefinite stand-down from Kiwi Sim Racing. Which Layout will we be using for Circut D'Albi? Sorry will be using the All Chicanes layout. Have updated first post to reflect this. I'm out of town without access to the server. So it won't be setup until the night of first practice. I can try setup a server tonight for the Week to allow drivers to practice on and test the Cars if people would like. It would be much appreciated if you are able to Seca. Erik, Ive chosen D'albi first cause its a relatively easy track, so hopefully the transition is a little bit easier! It's a fun little track. It feels pretty narrow at first but I've been doing some AI races in the E90 and there is more space than meets the eye at first. The chicanes definitely make the track more interesting. The E90 feels very different to the GT3 cars, just makes you realise who quick those GT3s really are but it should make for some nice door to door racing. Main server is all set for tonight. Could someone please help me with a setup for the E90? It's quite strange actually as I don't have this behaviour as much when I drive offline? Also offline I'm able to set 1:21-1:22 times but online I just can't get anywhere past a high 1:23. It just feels like a different car all together when driving online. Engine is probably compression locking. The gaps between the stock gears is quite high. You could try closing the ratios closer together, or shift a bit later. The GT3 Mod did have auto blip built in. I have noticed that too Erik. I tried to tune it out however have not played with brake mapping etc yet or messed around with the gear ratios. I have also noticed the car seems to shift very roughly even using an H-pattern shifter with clutch, down being worse than up. As bull said it could be compression locking, You could be changing down too soon. Try changing down later and use the brakes rather then engine braking. The other thing could be to much rear brake bias, what setting are you running with that? If it helps I will share my setup on Monday night once i have created one and im also sure others will be happy to share theres as well. I will be around on Discord tonight if anyone wants a hand with setup. I found that tightening up the gear ratios has made a huge difference in driveablity. Now i need to work on my lap times! How anyone can run a 1:21 or lower is beyond me! Thanks Matt for putting this together. Despite the sometimes iffy E90 mod, it was a blast and the track selection was very interesting! Will we see the points site being updated for the last 2 races so that we can see the final results?